What is Lead and how does it get in my drinking water? Lead is an element found in natural deposits that is used in various manufacturing processes. It is commonly found in plumbing materials, soil and old paint. In instances of high lead levels in drinking water, the most common sources are faucets made of brass or chrome-plated brass, lead-based solder used to join copper pipe, and in some cases, pipes made of lead that connect a home to the water main. Plumbing products used for drinking water are only allowed to have up to 0.25% lead in the wetted surface material of that product. This is a federal regulation enforced by USEPA. Within the BCWS water system there are no known lead service lines. 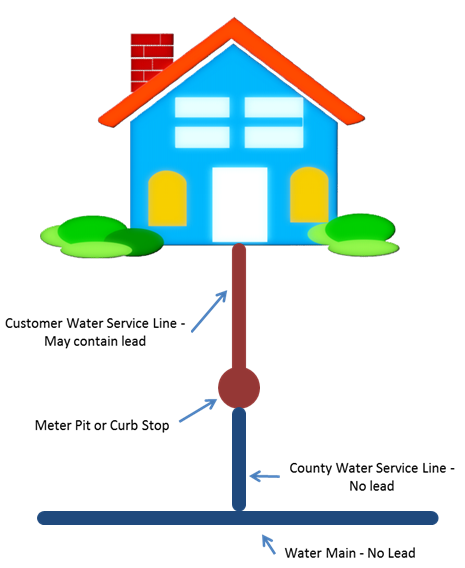 As shown in the diagram (below), BCWS service lines stop at the meter and although do not contain lead, lines to or within a customer’s home have the potential to contain lead. To assist our customers in identifying the likelihood of lead in your drinking water, we have developed a map which can be searched by address. Note the map requires the use of Chrome or Firefox. Parcels are marked by three colors, Red, Blue, Purple. Homes marked as Purple were built after 2014 and have the least likelihood of lead in their drinking water. Homes built after this date were under the standards of “lead free” meaning solder and flux with no more than 0.2% lead and pipes with no more than 0.25% lead. Homes marked as Blue were built between 1999 and 2013 and have an increased likelihood of lead in their drinking water. Homes built during this time were under the standards of “lead free” meaning solder and flux with no more than 0.2% lead and pipes with no more than 8% lead. Homes marked as Red were built in or before 1998 and have the highest likelihood of lead in the drinking water. Lead can cause a variety of health effects such as delays in physical and mental development in babies and children. In adults it can cause increased blood pressure and kidney problems. Most lead exposure cases are from paint chips and dust, however some homes may have elevated levels of lead in the drinking water from plumbing materials. Additional information can be found on the USEPA website link under “Learn About Lead”. If the water in the faucet has gone unused for more than six hours, let the water run until it gets noticeably colder, usually about 30 seconds to 2 minutes. To conserve water, fill a couple of containers with the first flush water to use for purposes other than consumption such as watering houseplants. Do not cook with or drink water from the hot water faucet. Hot water can dissolve lead more quickly than cold water. If you need hot water, draw water from the cold water faucet and heat it on the stove. Boiling water will not reduce lead. Never use water from the hot water faucet to prepare baby formula. Remove faucet strainers and flush out any debris that has accumulated over time. If you have recently replaced plumbing or fixtures in your home, remove loose lead solder and debris by removing the faucet strainers from all taps and running the water for 3 to 5 minutes. Then replace the cleaned strainers. You may wish to test your water for lead at additional locations in your home. There are two parts to BCWS' Lead and Copper program; a residential tap monitoring program and a water quality monitoring program. 1. The residential tap monitoring program consists of samples that must come from homes that have specific age and plumbing materials as defined by the EPA. Currently, we are on a monitoring schedule of once every three years for these samples. 2. BCWS also conducts regularly scheduled water quality monitoring in our distribution system and at our entry points. The limits for water quality parameters have been specified by EPA which we continue to meet and monitor per our required schedule. The EPA action level for lead is 15 ug/l and for copper it is 1300 ug/l. The action level is the concentration of a contaminant which, if exceeded, triggers treatment or other requirements which a water system must follow. The EPA maximum contaminant level goal (MCLG) for lead is 0 ug/l and for copper is 1300 ug/l. MCLG is the level of a contaminant in drinking water below which there is no known or expected risk to health. MCLGs allow for a margin of safety. Compliance for residential tap monitoring is calculated by comparing the 90th percentile sample of all the samples collected during each monitoring round with the EPA action levels. BCWS has been in compliance with the Lead and Copper Rule for all previous rounds of monitoring. BCWS’ compliance data is reported to our customers in the annual Water Quality Report that is available here.